We hear this all the time, and questions like this appear in Facebook groups and diet forums all the time. Frequently with people saying something like “excuse me for being stupid“. We will put that last one to bed straight away. You are not stupid! Let’s deal with “eat as much as you want“. First, how much do you want? Click this picture: you may get a surprise! Frequently our psychology and emotions around food get messed up. It starts with parental messages to eat up all your dinner or children will starve in Africa and is then manipulated by the HUGE sums of money that advertisers spend to program our brains to make us eat. The point is that some food makes you feel full up, some food leaves you hungry and there is some food that actually makes you hungry (mostly manufactured food, manufactured by firms with no interest in you being healthy, just in you buying more of their products. So, leaving on one side the psychology and emotions for a moment, if you STOP eating the stuff that doesn’t make you feel food, and replace it by eating the stuff that does make you feel full, then we can say “eat as much as you like”, reckoning that you will get to feel full quite quickly, that that will be “as much as you like” and you’ll eat less, and lose weight. But notice what I said there: “you will eat less”. Let’s move on. that makes me think I need a lot more research before I’ll give it a try!). Of course, we haven’t dealt with the psychology yet. Q: Why do bakers work so hard? A: Because they need the dough. You might like to try it for yourself. And how would it be if someone fed you, rather than you feeding yourself? My guess is that each mouthful will be smaller and that your “eating speed” will be slower. I think that we have learned to bypass or over-ride our “satiety” signals, and if we could fix that problem, then we would feel full sooner, and we would eat less. But notice what I said there: “we would eat less”. Losing weight is all about eating less. It’s about doing something that will mean that we are happy to stop eating when we are full. It is not about forcing ourselves to eat less. That never, ever works. And if you think it does, just look around you. All over the western world for at least the last half century, doctors, nutritionists and diet pundits have been telling overweight people to, “eat less, exercise more”. Does it look like this advice is working? I don’t think so. And then along comes Gary Taubes with his two books, [simpleazon-link asin="1400033462" locale="us"]Good Calories, Bad Calories[/simpleazon-link] ([simpleazon-link asin="0091924286" locale="uk"]The Diet Delusion[/simpleazon-link] in the UK) and [simpleazon-link asin="0307474259" locale="us"]Why We Get Fat: And What to Do About It[/simpleazon-link]. The book (WWGF) changed my life. Here’s why. There is a subtle subtext behind “If you eat less and exercise more you will lose weight” which says “you are fat because you are greedy and lazy“. Gee, thanks doc. When Gary says that this isn’t the way to go with this all the conventional pundits cry “foul”. They say it’s all a question of physics. If you take in more energy than you put out, that excess energy has to go somewhere and it will be stored as fat. Therefore, take in less energy and/or put out more energy, or both. It’s all physics and Gary Taubes should be burned at the stake (steak?) for saying otherwise. Here’s an example that Gary uses quite a lot. Think of a teenage boy. There comes a certain age where they seem to grow (tall) overnight. And they seem to be always in the fridge, except when they are in bed. But you don’t ever hear a parent say “My Tommy has grown six inches in the last three months, it must be because he’s eating too much and not exercising enough”. He is eating because he is growing. He lacks energy because all his energy is going into growing. And why is he growing? Well, we know, don’t we. It’s his hormones. And it’s our hormones that make us grow fatter, too. It’s just different hormones. With Tommy it’s testosterone and somatropin, with me it’s insulin. With Tommy it’s supposed to happen: if his testosterone and somatropin get out of whack he’ll either not grow, or he’ll be a giant. My insulin is out of whack: I’m only a giant width-wise. And it was eating too many refined carbohydrates when I was young and foolish (and middle-aged and foolish) as opposed to now when I am old and foolish, that damaged my insulin system. But I’m getting off subject, or at least on to a subject that I’ll come back to later. So, Do I have to Count Calories? Yes or No? Well, it depends (sorry!) You will only lose weight if you correct that energy balance: eat less or exercise more (actually, exercising more probably won’t help: it’ll just make you hungry). What we hope is that by eating less processed junk food, less refined carbs, by eating more “real food” (what your grandparents called “food”), by eating a balanced amount of protein and upping the amount of fats that you eat (etc etc: we’ll deal with precisely what elsewhere), you will naturally want to eat less. The trick to losing weight while eating as much as you like is to change how much you like. So if you are following your low-carb diet, or your paleo or primal regime or your ketogenic or auto-immune protocol, and you are not losing weight, then you are eating too much … BUT, the answer is not to just cut down, but to find out why. If you are significantly obese then it is highly likely that switching to a paleo or ketogenic regime will cause you to lose weight, without having to count calories. You will just naturally want to eat fewer calories. You’ll feel full up sooner. But as you get closer to your goal weight, where the margins for calculation are tighter, you may need to exercise more control. You may need to count something … not necessarily calories: it may be grams of carbs, or it may be getting the macro-nutrient ratios right. It may be paying better attention to micro-nutrients. I have heard it said that if we are missing certain micro nutrients in our diet that we may crave certain foods. I have also heard it said that modern food is only around half as nutrient dense as food that was commonly available 100 years ago. So, presumably, we need to eat twice as much (and hence get twice as many calories) just to get the same level of micro nutrients. Or it may be finding a way to re-wire your brain, so that you find more effective ways of supporting starving African children, other than by eating more than you need yourself. As so many of my articles conclude, it is highly likely that no-one has an off-the-peg answer to your individual question. Research is needed. The question is, will you pay a Harley Street nutritionist £125 per hour to do the research, or will you learn about food, nutrition and your own body, and do your own research? Go on, give me a hint! Some while ago the BBC made a programme called “The Big Fat Truth About Low Fat Foods“. I like this programme because they took an ordinary person (well, as ordinary a you can be, being an ex Blue-Peter presenter and an FHM model) and put her on a low-fat, packaged food diet for four weeks, to see what would happen. She is “ordinary” in the sense that she doesn’t have any particular health problems, is not a diet and nutrition expert, but generally eats a reasonable diet. For four weeks, model and former Blue Peter presenter Zoe Salmon ditches the fine dining she’s used to and lives on nothing but pre-packaged, highly-processed foods that are labelled either low or lower in fat. She finds out what’s in these foods and how they affect her moods, nutritional levels and, crucially, her weight. She also meets the low calorie converts who say that eating this way isn’t just a diet, but a way of life. I have this prejudice that says that British kids aren’t as obese, or as ignorant about food and where it comes from as American kids. I got a shock last evening. I was watching a UK TV cooking programme with The Hairy Bikers. They were cooking outside in a town centre with a live audience. As they prepared some vegetables and sampled as they went I heard a small boy say “yeuch! They are eating plants!” And that, in a very concise nutshell is a probably the biggest problem for our future. Did you notice the kids unable to identify a tomato? In the program (you can explore the whole thing, including Jamie’s prize-winning TED talk, on my blog post “Jamie’s American Food Revolution”) the kids in school couldn’t identify potatoes, tomatoes, onions, etc. We don’t have to go to extremes. Maybe 20 years ago we went on vacation and took a couple of my kids’ school friends. It was a self-catering holiday in France and we made a thing of going to local French markets, buying fresh produce and cooking it ourselves. My son’s friend was scandalised. For him, food wasn’t food if it didn’t come in a box or a packet. He had never seen an onion other than battered onion rings. And this was a middle-class lad with a father who worked for IBM, from a country town in southern England. If children don’t understand where their food comes from, what food is, how to grow, harvest, prepare and cook food then they are at the mercy of Big-Ag, Big-Food, Big-Pharma. They will have no option but to get fat, get sick, and be part of the first generation for centuries that died younger than their parents. Childhood obesity is probably even more worrying than adult obesity in many western societies, and doubly worrying as a parent. When you’re the one who is obese at least you only have yourself to worry about. So let’s think about what we can do. Before I begin, let me add to my normal caveat. I am not medically qualified, I am not a nutritionist, and I’m not a pediatrician. I wasn’t even a child, but that’s another story! We all know that the latest diet fad probably won’t help us adults, not least because we’re liable to get a bit OCD about it. That’s the last thing we need to burden our kids with. So what can we do? A lot of folk think that whatever diet that they are on can just be scaled down for a child, but I think that we need to think a little, first. There is one thing that children do, all their lives (as children) that adults don’t do. And that is … they grow! They need healthy nutrition even more than us adults, and so I believe the “eat less, exercise more” mantra is even more dangerous for children than it is for adults. Kids need their vitamins and minerals. We know (don’t we?) that a junk-food diet isn’t any good for anyone, so I believe that we must begin by educating our children on what is (and what isn’t) “real food”, and switching them gently over to a regime that is significantly lower on carbs (particularly high-glycemic index carbs), lower on wheat and sugar, and higher on good meat (organic, grass-fed) and good vegetables and fruit. For children, paying attention to the nutritional content of the food (micro-nutrients such as vitamins and minerals) is even more important than it is to adults, so if you can get them switched on to growing their own, and to taking good care of the soil that they use to grow their own, then you’re off to a good start. One of the first things that you can do, I believe, is to start to introduce your kids to where (healthy) food comes from. If you Google the name of your town with “organic farm” you will, no doubt, find some. I was inspired to write this blog after a question was posed by a FB friend of mine who lives in the Pacific North West, so I Googled and came up with Bella Organic. Check out their website: http://bellaorganic.com/ … what a great place to go for a regular family outing. Our own local farm, Beechcroft, isn’t nearly so organised, but is a lovely place to visit. Having visited an “old fashioned” farm, see if you can find a CAFO in your area, and just drive past. You will probably have your child’s interest! For children, being like the other kids is of extreme importance. It is something that is, I believe, hard-wired into our genes. In paleo times being a member of the tribe was a matter of life and death. You couldn’t survive on your own. In 21st century western society that has become somewhat perverted: if you aren’t wearing the latest designer label you won’t actually die–but it feels that way to kids, so we must avoid making them feel different. I think that joining, or making the right social group is really important, and I believe that learning about and becoming highly involved with growing and eating real food is important, so here are a couple of great role models. First, is Katie Stagliano, founder of Katie’s Krops. Katie was given a cabbage seedling in a pot in a class at school. She brought it home, tended it every day, and it grew into a 40lb cabbage! 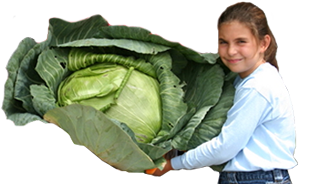 Katie took the cabbage to a local food kitchen where they were feeding disadvantaged and homeless people and it inspired her to encourage other kids to do the same. Now, all over America children, encouraged by Katie’s Krops, are planting gardens in schools, community centers and their own back yards, and are using the produce both for their own nutrition, but, more importantly, to help others. Why is that more important? Because children are naturally charitable. They care about things more than the average adult, and if they are growing food to help disadvantaged people they will probably care more about the quality of food they are growing than if they are just growing it for themselves. And as parents, we want them to care about quality food! There are lots of tips on Katie’s website; they even have a grant program, if you need some money to help get a garden going. And they have a Facebook page where you can follow what’s happening in the Katie’s Krops world. Coral is an eight year old unschooler and very passionate about nutrition! She hopes to help other kids learn how to eat and live more healthfully by eating real, whole foods, avoiding GMOs, and reading labels! She is currently making YouTube videos to help educate other children about exactly what is in the processed and fast foods that are being fed to many children today. So: there are a couple of good role models who I hope may get your kid to start taking an interest in food, real food. Lastly, there is Bettina Elias Siegel’s website, The Lunch Tray.com. This is a website by an adult, for adults, but her passion is to improve kids’ food, both in school and outside. She isn’t going for paleo, or even particularly low carb, but she is passionate about getting children to eat real food, not processed. This video is by Bettina. If it is “too young” for your child, then get them to watch it with you, and produce a critique, or say how they feel it relates to them. Everything we are doing here is to encourage our kids to be passionate about food and the potential it has to either make us sick, or make us healthy. OK, so that’s vegetables. But I am somewhat of a low-carb, paleo, ketogenic diet afficionado, so what about meat and protein? Well, Susan and I began keeping chickens after we baby-sat our grandson’s chickens (he had an Eglu and two chooks for a birthday present) for a couple of months while he was on a long vacation. By the time he came back we were sad to be without chickens, so now we have two and we are getting two more tomorrow. 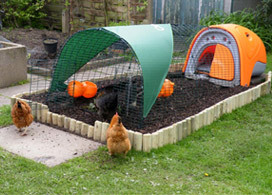 We don’t have much land, our entire back garden (yard) is about 100′ by 30′, and our hen run is 15′ x 12′. We get eggs, pets, and top soil generated for us. We have never had children visiting who weren’t fascinated! And those eggs are really healthy! So, we have looked at ways of getting children to understand where their food comes from, ways of getting them to grow healthy food, and ways of helping them understand what is healthy and what is not. There is, of course, one last step. They need to know how to cook! I don’t have a vast experience here (my son is a great cook, but I think that’s maybe more despite me than because of me! ), but again, I did some Googling. I’ll leave you to do the same (and refer you to the Jamie Oliver videos, where he spends quite a lot of time introducing both parents and kids to cooking). For a lot of help and advice, check out this “Cooking with Kids” page on Netmums.com. My last contribution here is to get you to watch this You Tube video of the fabulous Sarah Fragoso of Everyday Paleo, showing how to make paleo mayonnaise, with help from her boys. These lads will grow up healthy, I am convinced! Got some real young ones? This might grab their attention! This last section is, I know, controversial (it has raised some controversy here at home!) It’s just an idea … see how it fits with you and your kids. I have heard people say that you shouldn’t weigh yourself as an adult, and you should avoid the scales even more for a child. I don’t agree–but I also believe we shouldn’t be obsessing about weight. What we need to do is to “know thy enemy”. To decide just to ignore weight is to miss an important point … a point that is even more important for children. We live in society and society has norms. One of the norms in our society is that people weigh themselves and weigh their self-esteem at the same time. It is bad, it is wrong, but it happens. Just to ignore it turns it into the unmentionable “elephant in the room”. What I think we need to do is to understand the subject in some depth. So here’s my suggestion. Set up a science project with your child, to understand body weight. Here’s the first step. Get your child to weigh themselves every hour, on the hour, for a whole day, and to record the weight on a piece of graph paper (or, for the more tech-savvy, on a spreadsheet with a graph). Experiment. Weigh before and after having a meal. Weigh before and after going to the bathroom. I am still bemused by the fact that I can weigh less after a heavy meal, and more after a satisfactory bathroom visit! Look at how much the weight fluctuates over the course of a day. I am a large man: my weight can vary by plus or minus 5lbs (roughly 2kgs) over a day. Get your child to find out how much their weight can change over, say, two days (do it over a weekend). You should be able to find out when the “low weight point” of the day is. You will discover that you can lose or gain a couple of pounds just by weighing at a different time. It begins to put the whole thing in a different light. Then just try getting on and off the scales say 10 times in a row, and recording all those weights. That will give you an idea how accurate the scales are. And, in particular, if your child is a girl, and past puberty, try weighing every day for a month and see how her weight fluctuates. In every case record all the numbers. The two of you will learn a lot about science, a lot about weighing, and a lot about yourselves (you should be doing this alongside your child: maybe get the child to include the whole family in the project). It will be an eye-opener and will show you that a simple number: “how much I weigh” doesn’t tell you much if taken out of context. You also have to understand that weighing children has an additional problem that we adults don’t have: they are growing, and we expect them to get heavier as they get taller. Maybe if you weighed every day for a year, and plotted all those measurements on a chart, together with their height, and some other key measurements, you might see some interesting trends. While you are doing this, you are not aiming for your child to “lose weight”. You are simply running a science project together to collect some data to see what you can learn. Given that we expect them to weigh more as they grow taller, it might be interesting to divide weight by height, and plot that over time, too. I suspect that, if the child is beginning to eat more healthily as a result of a growing interest in real food, those numbers might reflect a movement towards leanness. In that project you might also try weighing before and after a walk, or a run, or a bike-ride, or a swim. What does any of that tell you? If your child is a bit chubby now (or even obese) remember that they are going to grow taller. If you get them off of the empty calories of junk food and on to highly nutritious real food, and doing some playing outside in the fresh air, I think it quite likely that they will naturally burn their fat reserves as they grow up, lessening the chance that they continue to grow out! A frequent question in these communities is “what should I eat?” This question might mean “what proportion of carbs, proteins, and fats should I eat?” It might mean “what actual foods can I eat, and in what quantities?” In every case the answer is always “it depends …” which is highly frustrating for the person asking the question. There are some calculators out there, but quite a few people, especially those less confident as computer users, or less confident with math (or both) have had trouble using them. This blog post intends to help! At the moment it is only talking about one calculator, Martin Ankerl‘s Keto Calculator: http://keto-calculator.ankerl.com/. This video should explain all. Below are some links that you might find helpful. Some notes appear as the video runs: you will find them easier to read if you make the video full screen (click the icon in the bottom right of the video). kcal or kilo-calories. It’s all very confusing, but a calorie is the amount of heat that it takes to warm up one cc of water by one degree centigrade. A Calorie (with a capital “C”), also known as a kilo-calorie (kcal) is what nutritionists use, and most people just lose the “k” and don’t bother with the capital “C”. So, if you see kcal or kilo-calorie, just know that that is what dieters call a “calorie”. Summary: don’t worry: ignore the “k”! Basic Metabolic Rate: The energy it takes to stay alive without losing or gaining weight. Lean Body Mass: How heavy you would be if you had no body fat. Note: if you had NO body fat, you would be dead! You always need some, just to stay alive. Body Fat Percentage: What percentage of your weight is body fat. There are various ways of measuring it. Many fancy modern bathroom scales will do it for you, if you just step on in bare feet. Pictures on the left for USA, on the right for UK. A simpler method is to look at pictures of people, labelled with their body fat, and pick out the nearest to you. There is a good set of body-fat pictures here. That’s it for now: I will be adding a tutorial on http://www.eatthismuch.com/ a little later. Effective Exercise: I believe that Nordic Walking is the best exercise for people on a ketogenic diet. Overview here, “How to Get Started with Nordic Walking” here, Who can do Nordic Walking here. Ketogenic What is a Ketogenic Diet, in a nutshell? There are those in the diet world who stick firmly to the “Calories In, Calories Out” (CICO) model, citing the “Law of Thermodynamics”. This is a bit of a problem, and can be easily knocked over as an argument. Firstly, there is no one “Law of Thermodynamics”. If someone quotes that at you, ask them if they mean the zero-th, first, second or third law. That will probably shut them up! The thing is that we have been advised to eat less and exercise more to lose weight for the last 50-60 years and during that time obesity rates have soared around the world. Clearly something is wrong. But while I am a total fan of Gary, and feel that his books have changed my life, the good old calorie can still tell us a few things: it can show you just how easy it can be to become malnourished when you’re on a diet. For instance, the “average” person needs around 2000 calories a day to maintain normal life. This, of course, varies a lot. According to the math I would need 3050 calories a day to maintain my current size, and my wife would need 1755 (she’s younger, much smaller, and more active than me). You can see that it’s quite a range. We know that body fat is a highly-effective energy storage medium: one pound (.45kg) of fat contains 3500 calories. So if we just go with the basic idea of “eat less”, if we want to lose 1lb a week we need to consume 3500 calories less per week, or 3500/7=500 calories less per day. For Susan that would mean reducing her daily calorie intake by 28%, for me I’d need to reduce by 16%. Beri beri, a disease caused by a lack of thiamin (vitamin B1) caused extreme lethargy and even death. 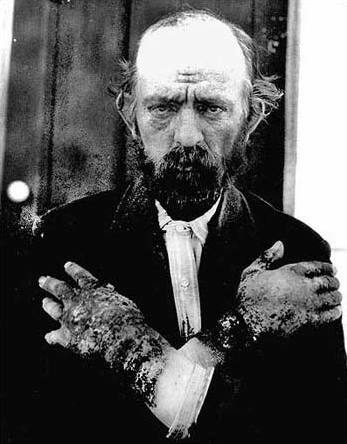 And pellagra, caused by a deficiency of vitamin B3 (niacin) affected more than three million people in the American south, killing 100,000 of them in the early part of the 20th century. I got quite a shock, researching this. I am from the UK but my wife is American and her father was a southerner. When she grew up she was accustomed to eating grits (from the same stem as English “groats”) and still enjoys grits when we go out to breakfast if we are in the Southern states. I have always laughed: to me grits looks like wallpaper paste, tastes not much better, and I imagined it to be completely devoid of nutrition, because grits is made from corn kernels, dried and soaked in lime (that’s the chemical, not the juice of the fruit!) But apparently, the key nutrient in corn (maize), niacin, is biologically unavailable (it’s locked up). However, if you treat the maize with lime it makes the niacin nutritionally available. Traditionally, new world cultivators of maize knew this (how?!) since 1500BC and didn’t suffer from pellagra, but when maize started being shipped around the world, people who adopted it without knowing about this process of nixtamalization developed diseases of malnutrition. Now you may think that these were all diseases of the past, and that we no longer need to worry, but here’s the interesting (and worrying) thing … these are diseases of extreme malnutrition, but malnutrition happens on a sliding scale. If you are bit short of micro-nutrients you might not suffer from anything as bad as pellagra, beri beri or scurvy, but your health will be negatively affected. Various governments publish “Recommended Daily Allowances” (known by various names depending on the government and the day of the week) for various nutrients. But these amounts are the amount that, if everyone in the population had that much, around 50% of them wouldn’t get ill. How much you need, not just to avoid malnutrition, but to be in optimum health, is probably much more than the RDA, or whatever your country calls it. So, if you are aiming to lose one pound a week on your diet, and you do it by reducing what you eat by between 15% and 30%, you’re reducing your micro-nutrients by that amount, too. Before dieting you were probably malnourished to some degree; now you’re dieting it’s got worse. We have all heard of pregnant women getting cravings–that’s because the baby is using up the mother’s micro-nutrients. The craving is the body’s drive to get the mother to correct the deficiency. The time from field to fork gets longer: vitamins start to decay once a plant is picked. In America the average distance travelled from field to fork is around 1500 miles. And if you think it’s better in Europe, just remember that most of your “fresh” vegetables and salad stuff comes from southern Spain. A tomato grown in a greenhouse in Malaga will have done over 1500 miles by the time it gets to a supermarket in Birmingham. Vegetables, nowadays, are picked before they are ripe, so that they will last longer on supermarket shelves. Food is irradiated, destroying its DNA. A lot of food is so processed that it has few, if any, micro-nutrients: what we call “junk food”. So, we are already eating a diet that is low on nutrition, and then we eat 15-30% less of it. Less of a bad diet is a worse diet, not better. No wonder we have cravings and get hungry. [simpleazon-image align="left" asin="098430472X" locale="uk" height="160" src="http://ecx.images-amazon.com/images/I/418yh6o7hML._SL160_.jpg" width="106"][simpleazon-image align="right" asin="0984755179" locale="uk" height="160" src="http://ecx.images-amazon.com/images/I/51AXQpauaLL._SL160_.jpg" width="115"]Well, I already knew a lot of this information about nutrition, but it wasn’t at the top of my consciousness until I read Naked Calories and Rich Food, Poor Food by Jason and Mira Calton. Time for a declaration of interest. Currently I have no commercial relationship with the Caltons at all. But I am so impressed with the books, and with their supplement, that I am hopeful that I may be able to import it into the UK. I’ll alter this sentence if and when that happens! By now you will understand the title of this post. If most of the food we eat is just “naked calories”, how can we make sure that our calories are well-dressed? The art and science of making sure that you have enough micro-nutrients is complex (one of the things I like about the Calton’s supplements is that they have made it very easy), but there are some things that we can do straight away. Looking at the list of problems above, you can see that eating your five a day will help, especially if they come from a local, organic farm. When we live in Florida we buy as much as we can from Lake Meadow Naturals (about 10 miles from where we live) and in the UK we use Sunnyfields Farm and Beechcroft Farm, both, I was surprised to find, exactly 9 miles away from where we live, but in opposite directions! Next, don’t keep stuff too long. Buying it fresh, organic and local is all very well, but if it sits in the veg drawer in the fridge until it’s floppy and unpleasant, you might have done better to buy canned or frozen! And educate yourself. For starters, read the Calton’s books, and click the various links on this page. And watch out for the next posts in this series. Which Avocados are best for Paleo/Primal? This is the first of a series of post that I will be doing which are more about micro-nutrients than continuing to push the macro-nutrient wars (HFLC vs LFHC). There doesn’t seem to be much warring going on in the area of micro-nutrients, and I think it’s vital that all of us who care about our health to understand the importance of nutrition, as opposed to just where do the calories come from. Anyway, much more of that in the future, but for now I am hunting down foods that are nutrient dense and which fit right in with eating well (whether you’re eating paleo or trying to stick to the “official” food pyramid). And my food of choice today is the avocado, which is healthy in more ways than several! In particular, you should be eating avocado with your salads and veggies! Why? Because a lot vitamins and antioxidants in your veg are fat-soluble. That means, if there’s no fat in your diet those vital nutrients go in your mouth and straight out the other end, without touching the sides! But if you have some slices of avocado in the same meal, you not only get all the incredible nutrients in the avocado, but the heart-healthy fats in the avocado (similar to those in olive oil) will carry the nutrients from the salad or veggies into your system, where they can be used. But there are two main types of avocado (well, actually there are loads … for a complete rundown check out this post from Food Republic: “Know Your Avocado Varieties And When They’re In Season“). The two main types that people know about are the larger, smooth-skinned “Florida” (picture courtesy of The Witchy Kitchen) and the smaller, dark and bumpy-skinned Haas or “California” avocado (what we buy looks more like the picture up right). You can see from the numbers that those who describe Florida avocados as watery are right (their water content is higher) and those who describe Haas as “oily” are also right: their fat content is 50% higher! So, if all you care about is low fat and low calorie, you will choose the Florida avocado (but, be aware these figures are “per 100 grams”. A Florida avocado is much bigger than a Haas, so you will probably end up with more calories anyway). And notice that the Florida might be lower in calories, but it is much higher in sugars, so if carbs are your concern, rather than calories, you will choose the Haas every time. And if you want those good, heart-healthy fats to help carry all the vitamins and minerals to where they can be used, Haas scores again, as well as the significantly higher amounts of vitamins and minerals. So, sorry Florida! I wish I could be promoting my home state. Maybe some Florida farmers can start producing Haas; here’s someone whose granny has grown a Haas tree in Florida. Personally, I turn most of my avocados into guacamole, add some of my special high-fat home-made mayo, and often add some other nutrient dense favourites. My current batch of guac is a slightly strange colour because I added turmeric! Tastes OK though, and turmeric is a master spice. More on that later.